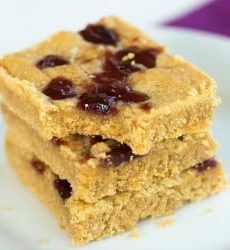 Peanut butter cookie dough is pressed into a baking dish and swirled with grape jelly. Preheat oven to 350 degrees F. Grease a 9x13-inch baking pan; set aside. In a small bowl whisk together the flour, baking soda and salt; set aside. In the bowl of an electric mixer, cream together the brown sugar, peanut butter, butter and granulated sugar on medium speed until creamy and light. Add the egg and vanilla extract and mix until combined. Reduce speed to low and add the dry ingredients, mixing only until the flour is just incorporated. Turn out the mixture into the prepared pan and press into an even layer. Drop dollops of the grape jelly over the top and use a butter knife to gently swirl into the cookie dough. Bake for 16 to 20 minutes, or until the center is set. Cool completely in the pan on a wire rack. Cut into bars and store at room temperature in an airtight container.